This makeover was in a 2nd floor Townhome in the Uptown area of Dallas. The couple who owned it wanted to upgrade/modernize the kitchen and both bathrooms. In the master bath, we gutted everything and then installed a walk-in shower with glass enclosure and door. We assisted in the selection of the tile and installed new floor tile and shower tile from Dal-Tile. We installed dimmable light fixtures and a super silent exhaust fan. In the Kitchen was quite small, so suggested installing some open cabinets and some with glass doors to open the room up and make it feel larger. You can see the waterfall glass in the kitchen cabinet doors. We raised the ceiling and added dimmable can lights. 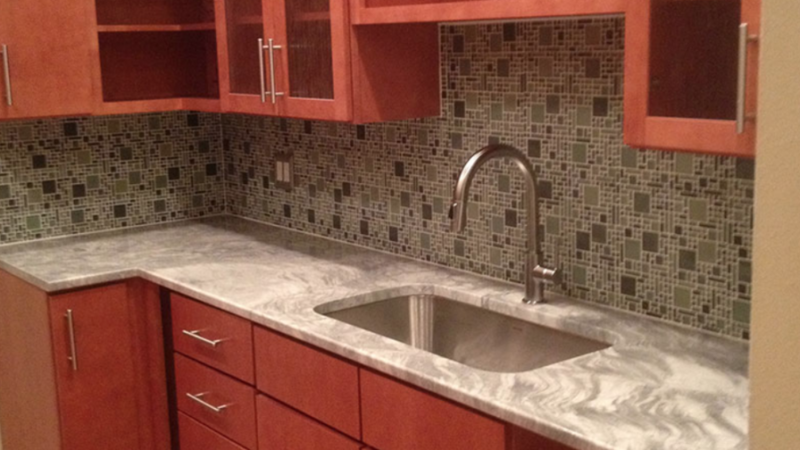 The homeowners chose high quality finishes in the kitchen such as granite, back splash, cabinet’s etc. The granite was a grade 1 or 2 granite costing $125 per square foot. We finished by installing all new stainless-steel appliances.